We are proud to offer Mi Rancho tortillas! We are impressed by their flavor and quality, but we love that Mi Rancho chooses to support local farmers and business by purchasing California ingredients! Every tortilla is uniform in shape, size, weight, and quality; and they contain subtle toast marks from their old world baking process. Now based in San Leandro, CA, Mi Rancho began as the only Mexican grocery store in Oakland in 1939, eventually being purchased by Robert Berber Sr. and Robert Berber Jr. in 1954. The father/son team expanded the grocery store and solidified Mi Rancho's place as the best place to find Mexican chiles, spices, and fresh tortillas. Eventually, things really took off when Mi Rancho began supplying tortillas and chips to local restaurants, and in 1992 began selling internationally. Today, Mi Rancho continues to be family owned and operated, combining their ancient family recipes with modern baking techniques to produce over 4.5 million tortillas a day with consistency and superior quality. 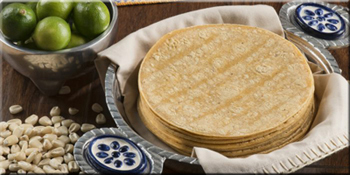 Corn Tortillas: Mi Rancho corn tortillas are delicious and durable. They are made using whole grain corn cooked with lime, then stone ground into fresh masa. Fresh corn adds strength to the tortilla that holds up to preparation– no need to double up. Baking slowly allows their corn tortillas to puff up and form flavorful layers. 4” White Corn– great for soft tacos and appetizers; available in a 6/60ct case only. 6” White Corn– use for enchiladas, tacos, and more; available by the 6/60ct case or by the 60ct pack. 5” Blended Corn (Sonora style)– made with yellow corn and wheat flour, this is the replacement for the Mi Abuelita Sonora Corn tortilla. Available by the 16/20ct case or by the 20ct pack. White Corn Cut For Chips– a 6” corn tortilla quartered. Available by the 30# case. Flour Tortillas: These hand-crafted flour tortillas are soft, thick, pliable, and delicious with a rich, irresistible buttery flavor. They are baked in small batches with the dough slowly proofed before being heat pressed, baked, and gently cooled for packaging. 6” Flour– use for fajitas or soft tacos; 6/24ct case only. 8” Flour– perfect for soft tacos, burritos, or quesadillas; available by the 5/20ct case only. 10” Flour– available by the 6/20ct case or by the 20ct pack. 12” Flour– available by the 10/10ct case only. 14” Flour– available by the 10/10ct case only. 12” Spinach– available by the 5/10ct case only. 12” Tomato Basil– available by the 5/10ct case only. 12” Chipotle– available by the 5/10ct case only.